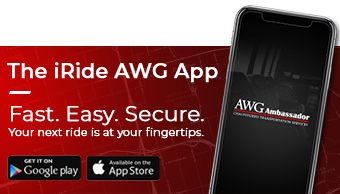 As the premier, Las Vegas transportation service provider and industry leader, AWG Ambassador delivers distinct transportation services designed to meet all your travel needs. Our uniformed chauffeurs provide superior service and have impeccable safety records. They are drug-tested and are trained in the latest in industry safety measures. For small groups or thousands of attendees, you can rely on AWG Ambassador’s experienced team of dedicated sales and VIP professionals. Our experts will facilitate all aspects of your event transportation. AWG Ambassador is supported by a technological infrastructure that is unrivaled in the industry. With reliable 24-hour state-of-the-art dispatch, seamless application integration, and exacting precision, AWG Ambassador delivers distinct transportation services designed to meet all your travel needs. We’re here to ensure you, and your guests enjoy the most exceptional transportation service available. We’ll work with you every step of the way so that every ride makes a lasting impression. We look forward to serving you and invite you to contact us with any questions you may have. Our teams are here to help! For company inquiries fill out the form below; you can expect a reply within 24-hours. TO BOOK YOUR NEXT EVENT. AWG Ambassador is a transportation services company based in Las Vegas, Nevada. Book your ride in seconds! Copyright © 2019 AWG Ambassador. All Rights Reserved.